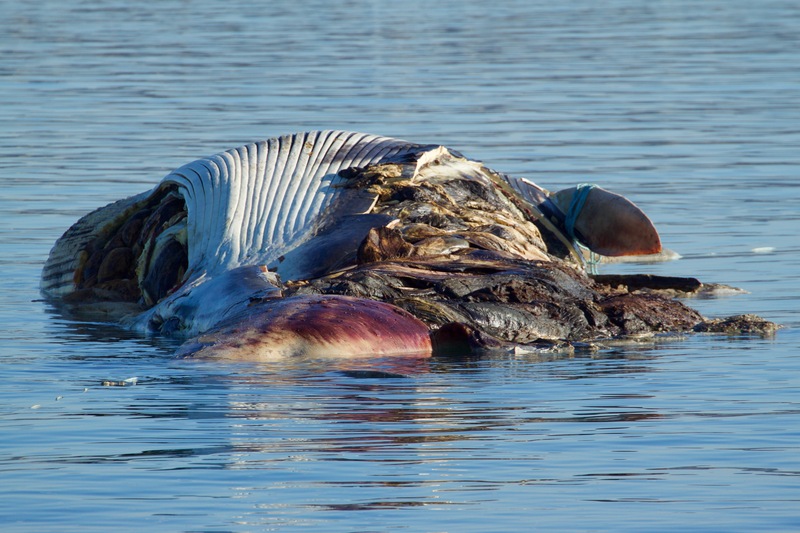 A dead 20.4m female fin whale washed ashore at Pt. Loma, San Diego on November 19, 2011. Marine Mammal Stranding Coordinator, Kerri Danil of the Protected Resources Division (PRD, NOAA) of the Southwest Fisheries Science Center made the initial examination and on November 23, San Diego Lifeguards pulled it off the beach using a fire rescue boat and towed it 6.5 nautical miles into Mission Bay, placing it on the western shore of Fiesta Island. Dr. Judy St. Leger, Director of Pathology at Sea World Parks and Entertainment, and Kerri Danil led a necropsy with a support team of about 20. The cause of death was determined to be a ship strike. Numerous vertebral fractures were found, along with significant areas of hemorrhage in the muscle surrounding these fractures, indicating that the whale was alive when the ship hit the whale. 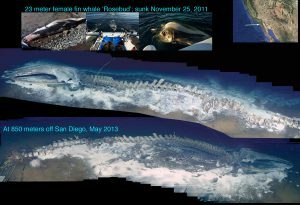 NOAA gave permission for the whale to be towed to sea and sunk for scientific research purposes and a collaboration between Virgin Oceanic (Eddie Kisfaludy and Chris Welsh) and Greg Rouse at Scripps Oceanography allowed this to happen. Using Chris Welsh’s 125’ catamaran motor vessel (Cheyenne) the whale was towed through Mission Bay to a site 12 nm west of the Mission Bay harbor entrance. 14,000 lbs of iron chain and shackles was attached incrementally to the tail region of the whale and released from the ship. Once all the weight was attached, the whale did not immediately sink. All but the head of the whale was underwater at this time and a large buoyant mass was observed holding the head above water under the ventral groove area. After about 10 minutes, a larger set of swells came past the ship and created enough force to push a mass of buoyant intestine out of the whale’s mouth. 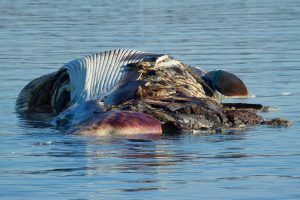 The whale then quickly sank to the sea floor in 850m of water. Two spherical glass ﬂoats were attached to the whale at the anchoring attachment point to act as sonar reflectors. The new whale fall (called Rosebud) has now been visited several times by ROV in 2012, 2013 and 2014 and the various kinds of animals that occur at the site have been studied. 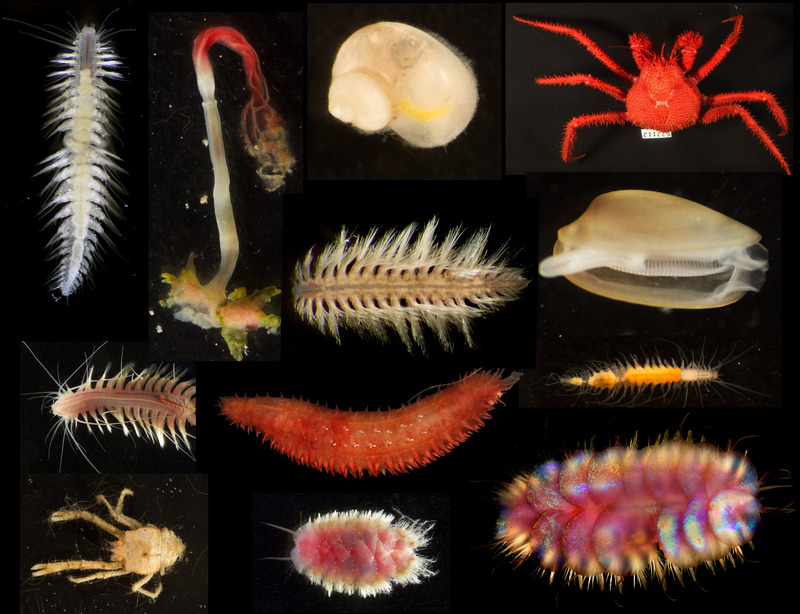 This has resulted in several new species being named and research on the organisms at the site is ongoing.